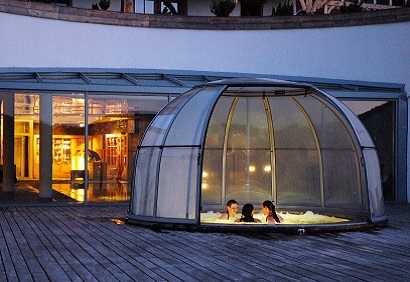 A pool or spa enclosure is a fantastic way to make use of your pool or spa all year round. Blue Cube Pools offer wide range of custom enclosures ranging from low rise enclosures which add a small height but ultimately help insulate your pool to larger enclosures which give you the added freedom to swim in all weather conditions. 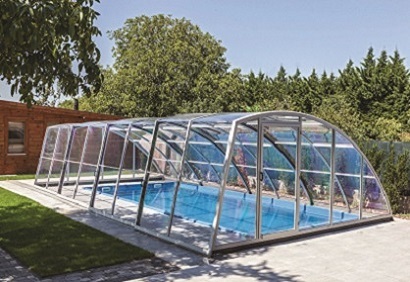 The Aquacomet pool enclosure is the perfect solution for the British weather, with a telescopic mechanism you can transform your outdoor pool into an indoor pools in just a few minutes, allowing you to use your pool as often as you like. 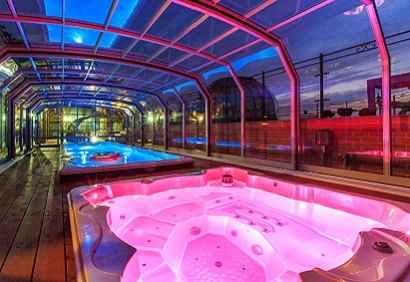 With huge ranges of colour options and numerous different styles, Blue Cube Pools can offer the perfect solution for your needs. For some a low rise enclosure offers an alternative to other covers such as solar and winter debris, although some low rise enclosures are not suitable for use whilst swimming we do offer medium rise enclosures with hatch access so that you can swim whilst fully covered. Blue Cube Pools also offer DIY solutions which are supplied quickly and are easy to build. We offer two glazing options either a polycarbonate cover or a styrol-acryl-nitrate, both offer excellent UV protection and are also thermally efficient. These come with excellent locking systems for added security. This product comes in a small range of shapes and sizes and doing not offer the same height options as the Aquacomet. The image above of the low rise is a customised Aquacomet. 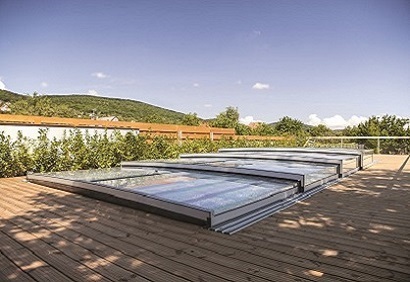 Alukov are an outstanding manufacturer of glass enclosures, offering amazing versatility and design features to create an incredible outdoor living space. Blue Cube Pools offer D.I.Y enclosure options and full installed, we also offer bespoke Oak gazebos which are the perfect partner for any hot tub.